When Southern Gutter Service first began looking at gutter guard and gutter cover systems we did a lot of research. We discovered a lot of similar and short term products on the market. Our research led finally led us to LeavesOut and we are convinced it is the best system on the market for both performance and quality. Handles up to 12 inches of Rain an hour! 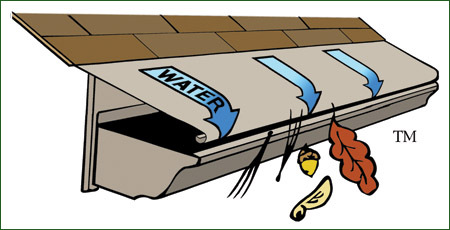 All solid metal gutter covers work on the same principle: rainwater flows over the curved edge of the cover and into the gutter through a gap small enough to keep out debris, using a principle of physics known as the Coanda Effect. The phenomenon of a fluid flowing in contact with a solid surface and tending to follow it even when it curves away, was discovered by Henri Coanda in 1910. The solid metal cover differs from mesh gutter covers in that it allows the debris to slide off, rather than become trapped and blocking the mesh. The LeavesOut product is made up of two parts — high-grade Alcoa® aluminum that has been treated on both surfaces with a finish having a lifetime warranty, and our patented, rugged, stainless steel clips. By using the finest grade of materials we can guarantee the product will last as long as you own your home. The LeavesOut panels are attached to the gutters (not the roof) using clips and stainless steel screws. The back edges of the 4 foot panels are then slid between the lower edges of the bottom courses of shingles or other roof material. By installing in this manner, we are able to create a solid connection to the gutters that will withstand high winds and other weather conditions without compromising any part of your existing roof. There are no screws or nails penetrating your roof. This also means we can easily remove LeavesOut if your gutters or roof ever need to be repaired or replaced due to damage or age. The finished installation gives the appearance of being one continuous piece.